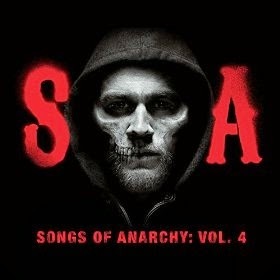 JP's Music Blog: CD Review: Columbia Records Releases The Soundtrack To The Final Season Of "Sons Of Anarchy"
CD Review: Columbia Records Releases The Soundtrack To The Final Season Of "Sons Of Anarchy"
One of the more successful series recently appearing on cable television, FX's "Sons Of Anarchy" has decided to call it quits after seven seasons. Almost as successful as the television show was the soundtrack which is known to take well-known rock classics and put a different spin on them, which helps make the music more memorable during the past season of the show. Columbia Records along with FX and Twentieth Century Fox have teamed up to deliver "Songs Of Anarchy: Volume 4," which was released on February 24th. The new twelve-track release begins with the angelic voices of children singing the opening verses of Queen's "Bohemian Rhopsody." The Forest Rangers take over the song giving it the true feeling of regret as the melodic changes are still present, but with a bit of a country twang. The duo of Audra Mae and Billy Valentine take on The Association's "Never My Love," slowing the tempo down of the original and injecting true emotion into the lyrics. The gentle feel of "Greensleeves" showcases the amazing vocal talents of Katey Sagal, while guest artist Ed Sheeran creates some of his most passionate and darkest music of his career with his cover of Foy Vance's "Make It Rain." One song that was overdue to appear on a "Sons Of Anarchy" soundtrack was "Baby, Please Don't Go," which was popularized by the Irish rockers, Them back in the sixties and has been resurrected wonderfully by Franky Perez & The Forest Rogers for this release. Singer/songwriter Amos Lee lends his talents and his soul to the Bob Dylan classic "Boots Of Spanish Leather," before the album closes with The White Buffalo & The Forest Rangers teaming up for the acoustic strumming sing-along of "Come Join The Murder." To find out more about "Songs Of Anarchy: Volume 4," please visit shop.fxnetworks.com.